In this example MarvinBeans API is used to create a MTextBox containing formatted text. The following paragraphs demonstrate the major parts of the MTextBoxExample.java code. 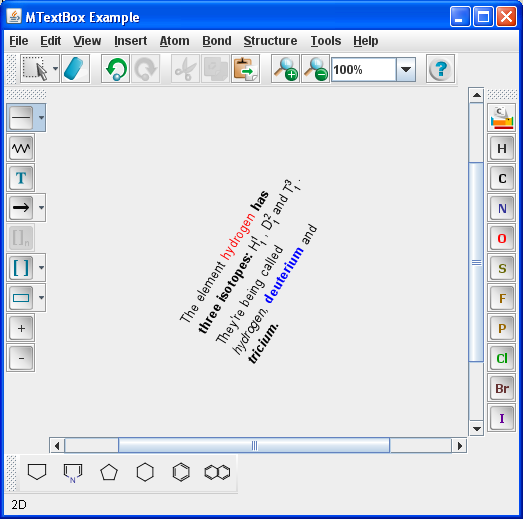 The source of the created text box can also be downloaded from MTextBoxExample.mrv . To create a text box an empty Molecule should be created first. The Molecule has an MDocument attribute to which a MTextBox object can be set. If the MDocument object is null, it should be created first. For transforming the coordinates a CTransform3D is needed. The following code creates an empty Ctransform3D then sets it to rotate the textbox around the Z axis with 45 degrees. After that the transformation center is set to be the center of the textbox and then the transformation is done on the textbox.